Daily NK is one of six news outlets that have emerged in recent years specializing in collecting information from North Korea. These Web sites or newsletters hire North Korean defectors and cultivate sources inside a country shrouded in a near-total news blackout. While North Korea shutters itself from the outside — it blocks the Internet, jams foreign radio broadcasts and monitors international calls — it releases propaganda-filled dispatches through the government’s mouthpiece, the Korean Central News Agency. But, thanks to Daily NK and the other services, it is also possible now for outsiders to read a dizzying array of “heard-in-North Korea” reports, many on topics off limits for public discussion in the North, like the health of the country’s leader, Kim Jong-il. The reports are sketchy at best, covering small pockets of North Korea society. Many prove wrong, contradict each other or remain unconfirmed. But they have also produced important scoops, like the currency devaluation and a recent outbreak of swine flu in North Korea. The mainstream media in South Korea now regularly quote these cottage-industry news services. 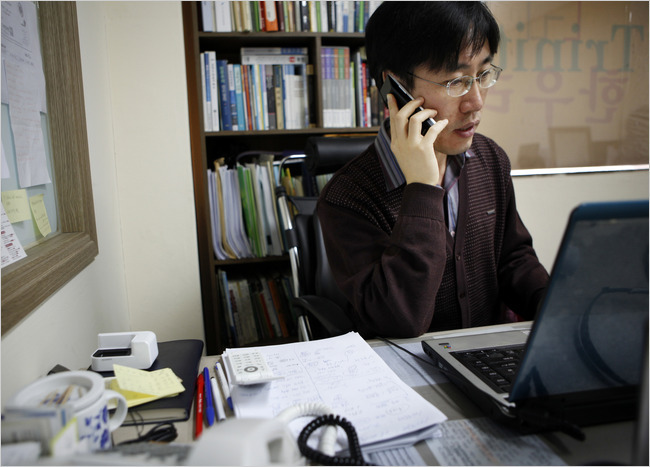 […] In the past year, the quality of the information these news services provide has improved as they have hired more North Korean intellectuals and former officials who defected to the South and still have friends in elite circles in the North, said Ha Tae-keung, a former student activist who runs Open Radio for North Korea and a Web site. “These officials provide news because they feel uncertain about the future of their regime and want to have a link with the outside world, or because of their friendship with the defectors working for us, or because of money,” said Mr. Ha, who also goes by his English name, Young Howard. All these news outlets pay their informants. Mr. Ha pays a bonus for significant scoops. Daily NK and Open Radio each have 15 staff members, some of them defectors, and receive U.S. congressional funding through the National Endowment for Democracy, as well as support from other public and private sources. Recently, they have been receiving tips from North Koreans about corrupt officials. “The fact that news comes out through civic groups like ours means that North Korean society is changing fast,” said Pomnyun Sumin, a Buddhist monk and chairman of Good Friends, a relief group based in Seoul whose newsletter broke the swine flu story last month. Some informants have become so adept with technology that they send text-messages, audio files and photos to Seoul by cell phone, said Kim Heung-gwang, a former North Korean computer scientist who heads North Korea Intellectuals Solidarity, a group of defectors that runs a news Web site. Bringing news out of North Korea is risky. Mr. Kim said that one of his informants was stopped last May while trying to smuggle out a video in a small camera hidden in a cosmetics bottle. She is believed to have killed herself in police detention, he said. Leonid Petrov‘s answer to IDG News Service on 8 June 2010. Q: What do you think an Internet (not Intranet) connection would mean for North Korea? The information hold of the government seems so tight that it seems unlikely. LP: There is no place for Internet in contemporary DPRK. If the people of North Korea have open access to the world wide web they would start learning the truth which has been concealed from them for the last six decades. Internet will make people asking questions, comparing things, and drawing conclusions most of which will be unpalatable for the regime. Unless Kim Jong-il or his successors feel suicidal, Internet (like any other free media) will never be allowed in North Korea.